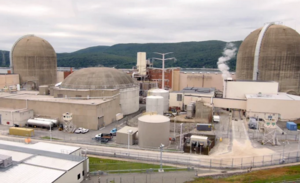 Entergy said last week that Unit 3 of its Indian Point nuclear power plant in New York has returned to full service, transformed after a $50 million investment to replace, overhaul, upgrade and inspect hundreds of pieces of equipment that help keep the plant safe. "Indian Point has operated safely for more than 40 years, and because of all the enhancements made over the years -- including backups to backups for fuel cooling -- the plant is safer today than ever," Larry Coyle, plant vice president and Entergy's top official at Indian Point, said. "The hundreds of inspections performed during this refueling help ensure it will operate safely well into the future." During the 23-day scheduled shutdown, employees and contract workers performed hundreds of activities that can be carried out while the unit is shut down. Major work included the overhaul and inspection of one of three low-pressure turbines and one of two main boiler feed pumps, the replacement of one of four reactor-coolant pumps, the removal and replacement of fuel into and out of Unit 3, and the testing and inspection of the Unit 3 reactor containment area for continued reliability and durability. "Refueling outages serve as an opportunity for us to perform inspections, maintenance and equipment upgrades that we would not be able to conduct during regular operations -- helping to renew and refresh the plant every two years," Coyle said. "During the Unit 3 outage, we replaced or upgraded hundreds of parts in key component areas."